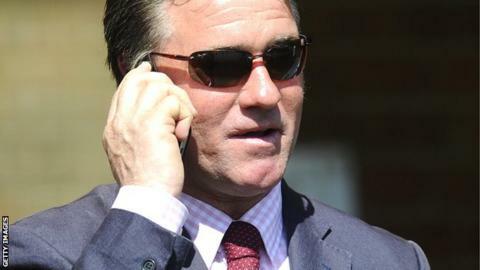 Trainer Gerard Butler has blamed "one disastrous lapse" and naivety after being given a five-year ban for injecting racehorses with banned drugs. The 47-year-old injected four horses with Rexogin, which contains the anabolic steroid stanozolol and is designed for use in humans. "It was wrong for me to cut corners but I did so principally through naivety," said the Newmarket-based trainer. Horses with an asterisk were injected with Rexogin. A British Horseracing Authority disciplinary panel heard he administered the banned substance Rexogin, which is popular with human bodybuilders, using a method of injection only qualified veterinary surgeons are allowed to use. He bought five boxes of the product online from a company that explained on its website that stanozolol was one of the substances which enabled disgraced athlete Ben Johnson "to achieve his magic sprints". Rexogin contains 10 times the concentration of the anabolic steroid that Sungate does. Irishman Butler has been a trainer in his own right for 15 years, but must now find new homes for all the horses he trains by Friday. "While this has been a devastating and humiliating experience for me, I am above all aware of its impact on others: not just my family, staff and owners but also the sport I have always loved," he said in a statement on Thursday. "I have no intention of hiding from my responsibility for an error of judgement that has undone many years of honest endeavour. "My sense that I had betrayed the standards I have always sought to maintain can be judged from the fact that I myself brought a number of breaches to the attention of the BHA." The BHA says his actions were "an appalling breach of his duty to look after the interests of the horses in his care". Butler had admitted his use of Sungate earlier in the year, which led to a wider investigation after he said more than 100 horses in Newmarket would have been treated with the product. Nine other trainers were found to have used Sungate on a total of 43 horses, but none faced action as the BHA said they acted on veterinary advice and there was an absence of positive samples. "I hope it has also become evident how widespread were the misunderstandings, among the training and veterinary communities in Newmarket, over the use of Sungate," said Butler. "With that in mind, I must emphasise that no harm resulted to any of the horses involved - and, above all, that I would never have knowingly risked any such harm. It was wrong for me to cut corners but I did so principally through naivety. "I am grateful for the many messages I have received that recognise this, and also how distressed I am to have let myself and others down. "I have made a big mistake, and am paying a big price. The consequences for my wife and three sons will be a daily reproach, harder to bear than any judgements passed by others. "All I can do is try to pick up the pieces. I will do so with a painfully renewed sense that the principles I neglected, in one disastrous lapse, will be those that serve me best in trying to rebuild my life." The loophole on positive samples being required before a trainer can face action in such cases has since been closed by the BHA.